This is Anthropology is an initiative designed to showcase all of the incredible things anthropologists do. In this portion of the AAA website you can learn more about the discipline of anthropology, find anthropologists in different parts of the world, explore the skills and careers anthropologists have, and find out how you can become an anthropologist. Use our interactive search tool to find out about the work anthropologists do around the globe. You can find anthropologists studying a particular subject, geographic area, or subfield. 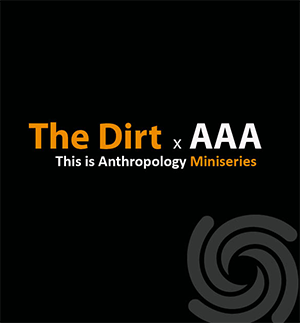 This five-part interview series was produced in collaboration with The Dirt Podcast, and all interviews took place during the 117th AAA Annual Meeting, held November 14-18, 2018 in San Jose, CA. Alice Beck Kehoe provides an illuminating, albeit blunt, history of the social and intellectual environment out of which the discipline of anthropology emerged in the United States. Association for Queer Anthropology co-chairs Casey Miller and Gregory Mitchell discuss the importance of mentoring for junior and established scholars, the increasing presence of intersectionality within research and representation in the discipline, and how informal mentoring has been crucial for the survival of queer anthropology since its early days. David Homa shares the necessity of incorporating anthropology in at all levels in classrooms, what he and his students love about learning anthropology, and the life-changing successes he’s had with bringing the world to his students without stepping foot off campus. Alisha Winn sits down with Anna and Amber to discuss her path through anthropology and how it brought her to working as an applied cultural anthropologist in blighted historic African-American communities. Consultant and multi-faceted researcher Rachel Ceasar walks through her journey from student in medical anthropology to her present career as a health and technology anthropologist. Considering a career in anthropology? The skills developed when completing a degree in anthropology are useful for living and working in today's world and interacting with people from many different cultural backgrounds. It's a great time to become an anthropologist! Today's anthropologists do not just work in exotic locations. Anthropologists can be found in a surprising array of fields and careers, including corporations, all levels of government, educational institutions and non-profit associations. Anthropologists also work in disaster areas, including Ground Zero in New York and the Gulf Coast in the aftermath of hurricane Katrina.